Music Hall was very popular across Victorian Britain. By 1868 there were 28 Music Halls in London and as many as 300 in the rest of the country, Sheffield had 10, and Manchester and Leeds both had 8. They varied in décor but they all served food and alcohol and provided a cheap night of entertainment. Dishes such as pease pudding, oysters or steak and kidney pie were served all for about 1 shilling. 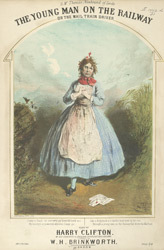 Sorrowful songs were popular as the performer could exaggerate their emotions, in this case lamenting the loss of a loved one to a rival suitor, and cry noisily into large handkerchiefs. We can see the start of the British tradition for laughing at ourselves.